It's an exciting Enviro Day today, because over the weekend lots of mums and dads have helped to make our edible gardens much bigger! We went down first thing, with Mrs Daniel, to see. They look fantastic!! 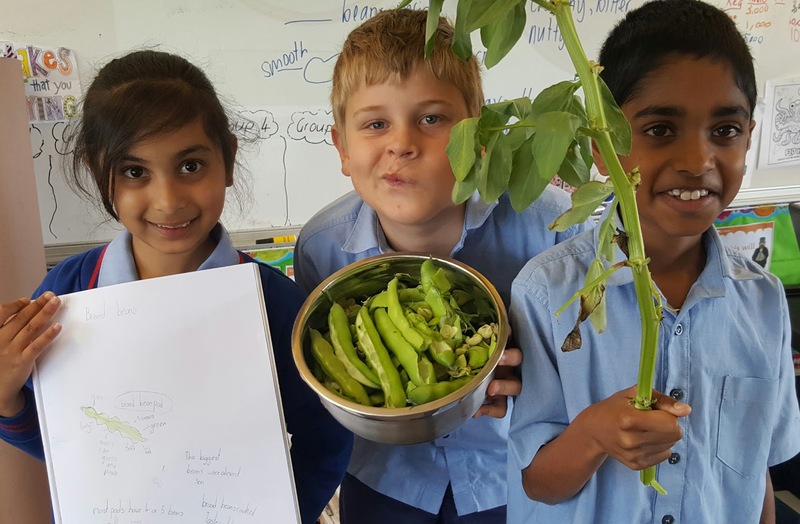 While we were visiting the gardens we harvested some broadbeans and took them back to class. Next we sketched and labelled the pods and beans. Then we shelled, cooked and ate the beans. 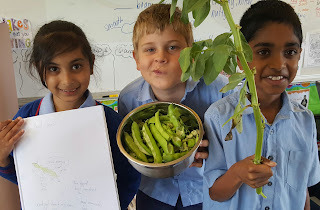 While we worked, we collected data about our broadbeans. We discovered most pods have 4 or 5 beans. The most beans in a pod was 6 and the least was 2. The pods are about 15 cm long. The biggest beans were nearly 3cm long. Eighteen children out of 24 liked the taste of the cooked broadbeans and six thought they were yuck. What a fun way to help the Earth and do sketching, science & statistics!